Owning a dog is an experience full of joy, and is great for your overall wellbeing. It’s also work. 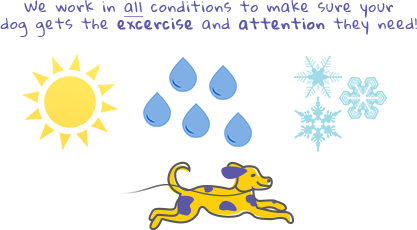 Fitting in all the activities your dog needs to thrive can sometimes be a challenge. That is where Hustlin Hounds comes in. We are one of the highest rated dog walking providers in Fort Collins. Our professional dog walkers take the time to nurture your dog with the great smells from outdoors while providing the exercise your dog needs and craves. A dog walk with our team means socialization with other dogs, plenty of time to frolic and play, and the love and attention they need while you’re at work or away. Hustlin Hounds is more than a Fort Collins dog walking service. We also offer pet sitting services for our Fort Collins clients. The pet-care experts at Hustlin Hounds are trained to administer medicine, feed, and play with dogs in any way you specify while you are away. Different dogs have different needs, each one is unique. We listen to our clients when we take on a new dog. Contact Hustlin Hounds to find out how we can make your dog’s day with the best dog walkers and the best dog walking Fort Collins has locally. Only the best dog walking services will do for your dog, so make Hustlin Hounds your first call.